Stephanie Mawson, a mine engineer at Cigar Lake, says working at a remote mine site is an intense, but rewarding, experience – and one she believes is well suited for younger employees who can take advantage of the freedom and flexibility offered by fly-in, fly-out shift work. "It's definitely a lot different than a Monday to Friday, nine-to-five job," says Mawson, 29, a mine engineer at Cameco's Cigar Lake uranium mine site in northern Saskatchewan. "But at my age, that's part of the appeal." Mawson currently works two weeks on site and then has two weeks off (home base for her is Saskatoon). When on site, she works 12-hour shifts, seven days a week. The work is innovative, challenging and, at times, stressful. But the workplace culture is informal and convivial ("there's plenty of joking," she says) - a way to counter the long hours and demands of the job. At the same time, the opportunity to have two weeks off every month (even more when combined with vacation days) provides a lot of time for a young person to pursue personal goals and interests. "There are a number of young engineers who have been able to pursue a master's degree while still working full time by scheduling classes and studies during their time off," says Mawson. "In my case, it's allowed me to do a lot of travelling, which is something that I love." Mawson spent four summers working for Cameco while pursuing a degree in geological engineering at the University of Saskatchewan. She worked at two of the three northern Saskatchewan mine sites operated by Cameco, one of the world's largest uranium producers. 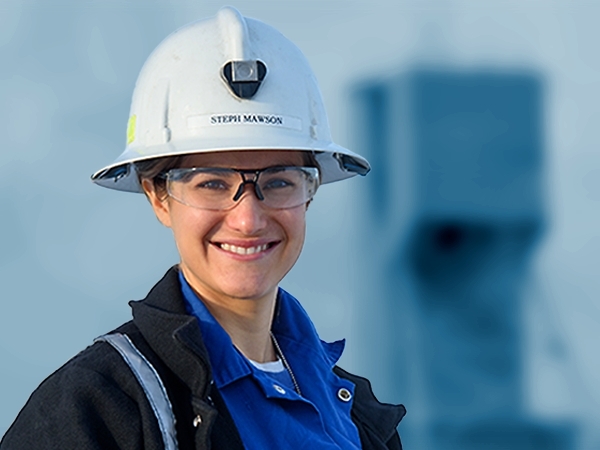 After completing her degree in December 2011, Mawson was hired into a new graduate position and automatically enrolled in Cameco's Engineer In Training (EIT) Program. The program offers on-the-job experience and training to develop critical knowledge and skills, helping to prepare young engineers for technical or management careers. As part of the EIT program, Mawson did work placements at Cameco's head office in Saskatoon and in various roles at the Cigar Lake mine site. She was recently promoted to the position of Mine Engineer, working in the area of ground control. Mawson says her experience as a summer student and a member of the EIT program helped her make the transition from school to career. "I've worked with a wide variety of really experienced people from different backgrounds who have given me the benefit of their advice and knowledge," she adds. "Everyone has been really welcoming and willing to help a young engineer out." Reproduced with permission from the Canada’s Top Employers for Young People (2016) announcement magazine. © 2016 Mediacorp Canada Inc., all rights reserved.